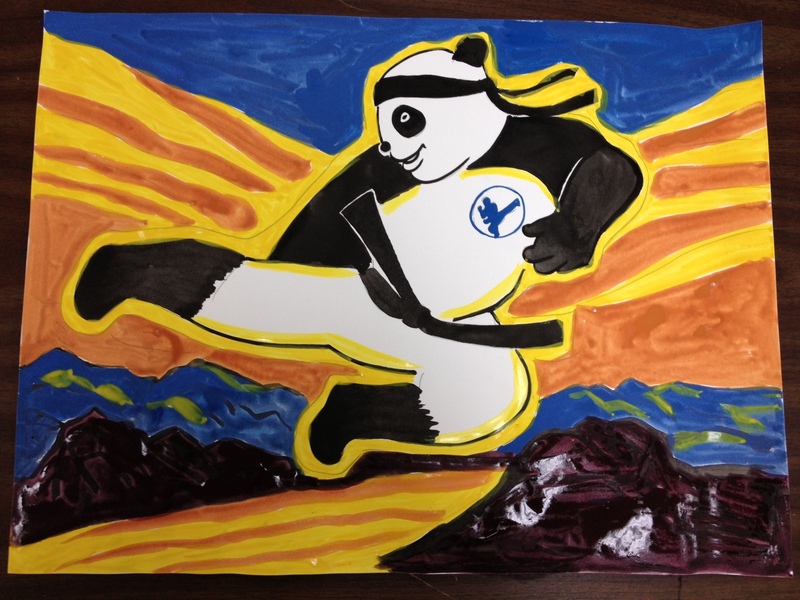 Ms. Li was inspired by her daughter’s Tae Kwon Do flying side kick, she decided to craft a series of very cute Tae Kwon Do pandas, dedicated to Mr. O’Malley and his wonderful Tae Kwon Do Center located in Peabody, MA. 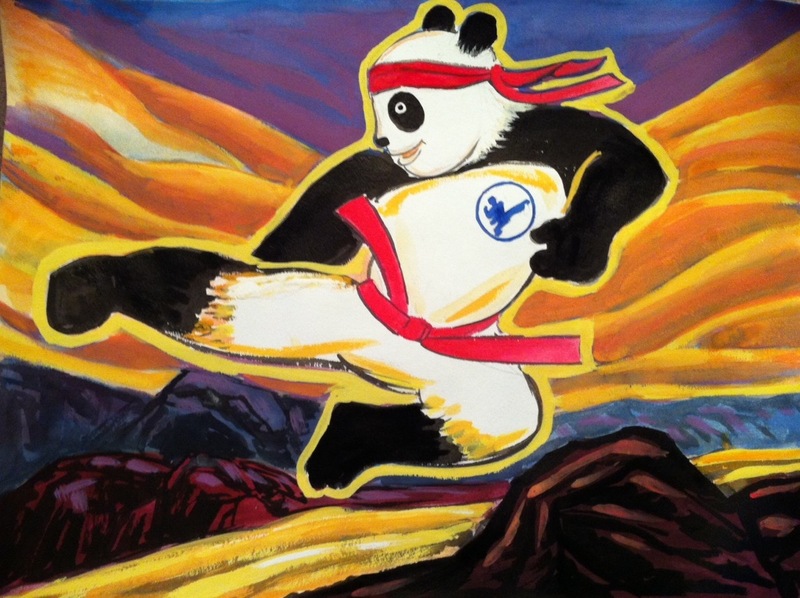 Today, we are showing you the process of how this Tae Kwon Do panda is developed in 1.5 hours. 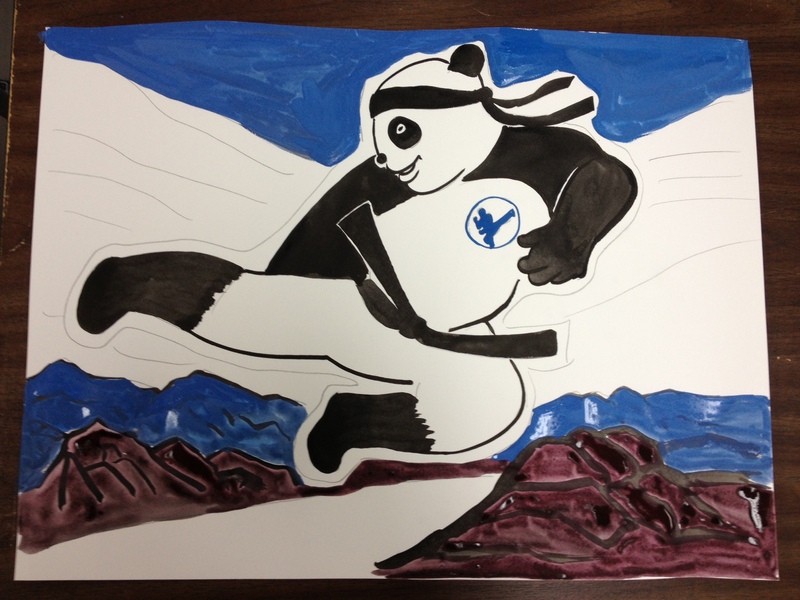 The work in progress painting shown below is done by Li’s adult art student. Please note: given the time contraint of the art class (1.5 hrs), Ms. Li was able to simplify this painting so that it can be completed by all of her students (at various levels) in the class. The students are given instructions for if they’d like to further develop this work after the class. 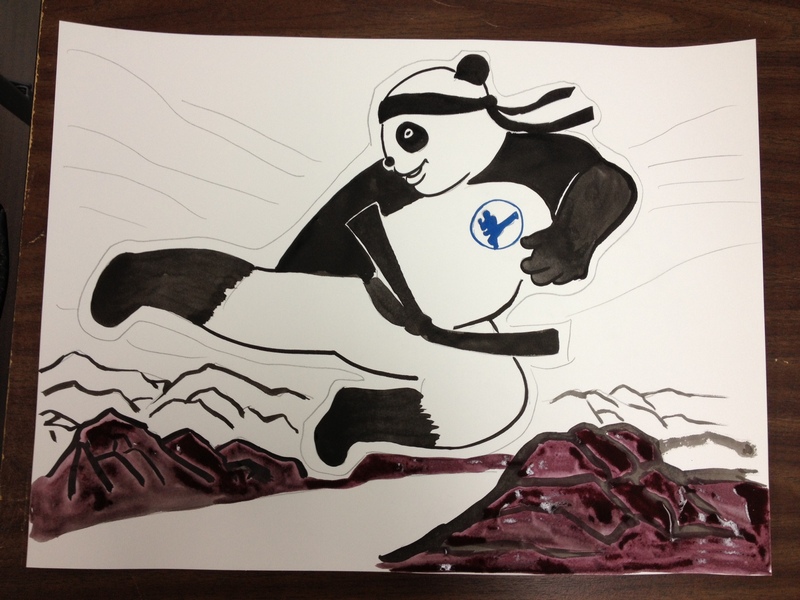 Part 1: Outline and paint the panda using concentrated Chinese ink. The mountains are achieved using broad strokes, with a layer of dark purple as base color. Part 2: Paint the mountains that appear farther away (behind the purple ones) in blue. Use the same color for the sky. Part 3: A combination of orange and yellow are applied in sections as the background. The yellow color is also applied as outline for the panda. Furthermore, these bright colors can be used (in the end) to highlight the mountains to introduce additional dimensions. As you compare the final student painting above with Ms. Li’s sample work at the top, you will notice that Ms. Li spent more time defining the layers for all the subjects (mountains, background, sky, etc.) so that the colors appear more connected, less isolated from one another. For example, the sky blue and the yellow background can be connected using a color in between, such as a rose or magenta color theme. Various shades of yellow and orange can be reapplied on the background to make the painting more sophisticated and three dimensional.